I have been following Edenbridge from Austria closely since their debut in the year 2000. They have always played a sophisticated mix of symphonic and melodic metal. Their last album Grand Design from 2006 started earning more negative reviews than in the past, although I still liked it a lot. Let’s hope that their new and fifth studio release MyEarthDream will be luckier. They obtained interesting support from the Czech Film Orchestra which has a lot of experience recording movie soundtracks. The CD starts with the seemingly mandatory intro, but it convinces with sufficient bombast and darkness, reminding of Richard Wagner. The employment of a real orchestra makes for an atmosphere synthesized computer sounds could never have achieved. The first regularsong Shadowplay underlines immediately the band’s qualities. Sabine Edelsbacher is still one of the best metal front women in the world. Her expressive voices combined with the heavy guitar work may be unusual, but also unique in this genre. The excellent keyboards add the songs a progressive touch. 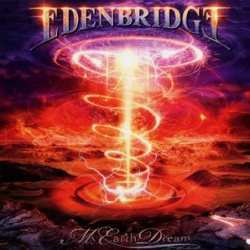 Edenbridge thus succeeded in bridging the gap between harder metal music and more commercial sounds. Variety is again of utmost importance, underlined by oriental parts that have been included into two songs. Undying Devotion shuffles sweet, mystic and hymnic elements, and although this track is one of their softer pieces, it still works perfectly. Fallen From Grace overwhelms with surprising double bass drum attacks. The thirteen minute long title track ends the album with an appropriate synthesis of all which preceded. Even the album’s ballad Whale Rider works fine by me. The vocals could as well be from a cartoon princess of a Walt Disney animation movie, but the orchestral arrangements save the day. Critics will have a hard time finding anything to complain about this time. The band stayed true to itself and its sound, but the songwriting is very advanced again, and the idea of using a real life orchestra paid out in the end.